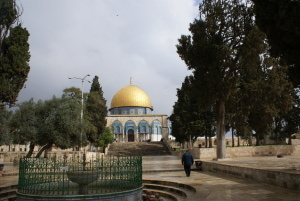 We have breakfast then go and visit the Al-Aqsa esplanade. We make the most of this quiet moment before the tourists start pouring in. "Pouring" is not the exact word. Indeed it seems that everything is done (by the Israelis) to put off the visitors - limited and/or unpredictable opening times, access through a passage hidden unwelcoming palissades, strict controls at the entrance, ... And yet, what a splendid place it is, so peaceful! We are miles away from the uproar of the souks and bazaars for the tourists, and even farther from the checkpoints and their soldiers armed to the teeth. We then go down and up through the Muslim quarter to Damascus Gate where we meet Daoud again. This morning, he is taking us to Sheikh Jarrah, a district located on the north of the old city. We heard about it in one of the films we watched yesterday at Spafford Centre. On our way down there, Daoud reminds us of a few facts. 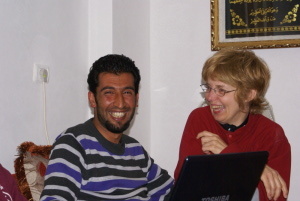 Laurie, whom we have just translated the information to, pulls a face: she doesn’t believe what Daoud has just told us. For her, these are only tales aiming at confusing the issue and pretending to be what you are not. Anne-Claire gives her further examples of Palestinians being denied their rights, other situations that are indeed hard to believe because they are so absurd. Yet, unfortunately they are all true. Laurie lets her talk for little while then says: "I’m listening to you, but you are not going to make me change my mind". Tanguy makes a sign to Anne-Claire: "let’s give her the time to discover things on her own..."
Daoud tells us that there are important buildings in Sheikh Jarrah: the House of the East (which the Israelis closed), the Palestinian National Theatre, the American Colony, consulates and posh hotels. We’ll go to one of them later to attend a press conference on the problems that Palestinians schools encounter in Jerusalem. “This district is an example of what is called the "internal colonisation" of Jerusalem (as opposed to the settlements that surround the city). Other example of it are Silwan, Ras Al-Hamoud, Mount of Olives... The settlers here fully participe in the judicisation of Jerusalem. 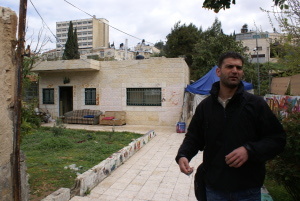 In Sheikh Jarrah, they plan to build 450 more homes”. Translation: consequent forcible expulsion of as many Palestinian inhabitants. The settlers are inside. We won’t see them. Where do the Al-Kurd live now? Behind us, a flag flaps in the wind. 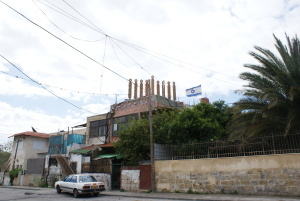 It is pitched on the upper terrasse of another house Israeli settlers have taken over. They are watching us from behind their windows, obviously accustomed to this house being visited. What can we do in front of such a well-oiled machine, except testify on what happens here, talk about the unacceptable reality of some people’s rights being trampled underfoot by some others? .We leave Sheikh Jarrah in silence. Daoud has arranged for us to attend a press conference now, in the Ambassador Hotel: « Call to save the educational system in Jerusalem. » People in charge of education in East-Jerusalem are going to discuss the problems Palestinians schools encounter in Jerusalem. The hotel is a fantastic place. We feel a bit embarrassed with our KWs and backpacks but Daoud assures us that it really doesn’t matter: we are welcome. We sit down on the comfortable stuffed chairs: smooth carpets, journalists, cine-cameras and a long rectangular table for the speakers. OK, we are ready. The Arabic interpreter deserves credit for the different speeches are quite long. He takes down notes then tackes to give an account of the main ideas in English. The second speaker is a teacher wearing a moustache. For him, all these manoeuvres are only the first steps against Palestinian education, he warns. “Schools can’t stand the attack without help from the officials anymore”. He gives some examples of “intrusion”: “The emblem of the Palestinian Authority on the books has been replaced by that of Israel. No mention can be made anymore of the Naqba, or of Tel-Aviv being in fact the former Palestinian town of Jaffa”. He reminds the public of the situation of the Palestinian inhabitants of the city: “In Jerusalem, Palestinians are considered as residents only. They have not been and will never be granted citizenship. There will be other steps soon, all aiming at making life more and more difficult for the Palestinians: schools will be closed, tax will be higher, it will be more and more difficult to get a license… Concerning education, if things go on like that, in a few years’ time the Israeli curriculum will have totally replaced the Palestinian curriculum and Palestinian children will be taught that the 1940-1945 holocaust completely justifies the creation of Israel and entitles the Israelis to occupy Palestine”. Arguments put forwards are. We wave thank-you and goodbye at him and slip away discreetly. We don’t have the time to share what we feel about what we have just heard. We are in a hurry.We can only have a quick bite before running back to the youth hostel to get out bags and jumping into a bus that’ll take us towards our second important meeting-point: Al-rroub camp, where “our” young refugees are waiting for. The truth is we know very little about them, only their first names, in particular that of Hassan, who answered the little "guess who is who ? "game we sent by e-mail before we left to Palestine qui-est-qui?" : "Try to match our photos with the anonymous descriptions we have made of ourselves!”. He managed quite well and we want to congratulate him for that! We walk down towards Damascus Gate briskly. Next to the bus-station, we have a quick lunch of falafels (and what are supposed to be French fried potatoes, but are hardly acceptable for the Belgian experts we are in that matter!) in a snack where, once again, we are really nicely welcomed. We then run to the hostel, get our bags, which we drag to the 124 bus-stop. We all feel sooo frustrated not to have been able to kiss Daoud good-bye. Fortunately, we know that we will see him again when we come back from Al-Arroub in 10 days’ time! Only a small quarter of an hour later, the bus pulls in front of Bethlehem Checkpoint in the infamous "Apartheid wall" that separates Israel from Palestine. We will now have to pass through it : a concrete building at the end of a dead-end street. Everybody gets out of the bus before it makes a U-turn and leaves back to Jerusalem. We were expecting the worst, or at least, to have to wait for quite a long time, hear and see soldiers yelling orders and shoving the people along - we had read the account the 2009 Taayoush group had made after their travel. But we go through the checkpoint without problem. The silent place looks empty, lifeless. This won’t be the case for the Palestinian workers who will be coming back from work in an hour or two, Martine tells us on the cell-phone. She is the Belgian volunteer with whom Tanguy and Anne-Claire have organised our stay in Al-Arroub. She is waiting for us “on the other side”, she confirms to us. Once we have passed the barriers, the checks, the turnstiles and after following a long corridor covered with wire netting, we find ourselves in the middle of hawkers who greet us, ahlan wa sahlan! (welcome) and invite us to have a look at their goods, mainly fruit. There are tens of taxis or private cars parked without any order, all waiting for friends, family members or customers and ready to take them to Bethlehem or its surroundings: how can they manoeuvre in such little space ? . We are a bit at a loss. But there is Martine, what relief! Tanguy and Anne-Claire hug her warmly: they haven’t seen each other for two years! We greet her and the group share into the two taxis that are going to drive us to Al-Arroub refugee camp. So, that’s it: we are on the other side of the wall, "confined with the Palestinians" for ten days… We fill our eyes with the first pictures we are now getting of occupied Palestine, also called the West Bank, or more euphemistically (by the Israelis) “the Territories". About twenty minutes later, the taxis branch out on the left, leaving the main road from Bethlehem to Hebron behind, and enter the camp at a slow pace. The "main street" is narrow. It doesn(t have any real pavements and is lined with little stalls and shops that are all opened on the outside: fruit and vegetable, chicken, sweets, a barber’shop, a repair shop… obviously only the bare necessities. There are dozens of children of all ages, each more eager than the next one to have a glimpse at the faces of these foreigners descending in their camp. As Martine explains to us, very few foreigners come to Al-Arroub (contrary to Aida Camp, where Taayoush Group stayed in 2009). Suddenly Anne-Claire, who was looking out of the window, shouts to the taxidriver: “Stop! It’s my friend! It’s Tareq, my friend!...” She has just recognized one of the young people they met two years ago in Aida. She jumps out of the taxi even before it comes to a standstill, she is sooooo happy to meet her friend again! When they said goodbye, none of the members of the 2009 group knew if they would see each other again one day. And there he is, standing in front of her, with the same wonderful smile, the same sparkles in his eyes. With, in addition, a two-year-old boy on his arms, the little Watan (‘Homeland’ in Arabic), whom they had only seen a picture of, when they had come to visit Tareq’s house in 2009. He was only a baby then, now a really cute kid with wide black eyes and cheeks like two red apples. She hugs and kisses the young man, just like that, in the middle of the street, and realises only in afterthought that maybe this is embarrassing for him, that you don’t do such things in public, that women are not supposed to, etc... Well too bad! She makes him get into the taxi next to her and doesn’t let him out of her sight anymore. The fact is, the flat we are going to stay in is only a few meters away. A crowd of little kids welcome us and fight to help us carry our bags to the porch of the house. A big lean guy is there too, with his hair in tiny spikesof hair gel and an incredible smile. He is Abed, one of the young people we are going to share our project with. From the start, he has proved to be exceedingly kind and funny too, and so he will be all along our ten-day stay in Al-Arroub. Tareq is the one found this place for us to stay, after quite long research. It is in fact the ground floor of a house. The fitout works are almost over. Noah, Youssef’s brother, should have moved in after his wedding but, for some reasons, he finally didn’t get married and still lives upstairs with his old mother and the rest of the family. Youssef unlocks the door of the flat for us. It is quite heavy, almost a security door, and there are wires and bars on all the windows. It looks a bit weird to us... In a first room on our right, there is a pile of matresses and blankets. At the end of the corridor, a kitchen with what is strictly necessary, among others, the famous large flat pan from which everybody can eat at the same time. A bathroom, two toilets (one of which Turkish, will avoid using it), a second room which we will turn into a second bedroom and a central hall with two beds/sofas where we can sit together, have our meals and meet our friends and visitors. “Cooee!...It’s me!...” A little voice full of sunshine: Sandra has rejoined us. Tanguy and Anne-Claire give her an enthusiastic welcome and introduce her to us. Apparently, their Brazilian friend hasn’t changed much since they last saw her in 2009: still tiny, so lively, always smiling and busy! Still there too, in spite of administrative hassle. It has been three years now since she started working as a volunteer in Bethlehem and the surrounding refugee camps. At the moment, she is waiting for a new visa... in other word not really supposed to be there, in occupied Palestine. If soldiers control her, she risks having serious trouble. “But if you give your fears too much space, you don’t do anything anymore,” she says shaking her little ponytail. Daoud said the same thing, didn’t he ? Sandra simply hopes that, once again, the Israeli authorities will give her the necessary document. She is obviously delighted to meet Tanguy and Anne-Claire again. Two years without seeing each othet, and it is as if they had met the day before! Of course, they have exchanged mails to organise the project, together with Tareq, find a place where the group could stay, find young Palestinians in the camp who would be interested in meeting the Belgians. But it is so great to meet in flesh and blood again, to be able to hug each other, look into each other’s eyes, smile at each other…! Reunion chatter and chatter. In the meantime, we (the younger ones ) have shared the bedrooms, put the matresses on the ground, the sleeping bags and the blankets on top. Sandra offers now to answer all the questions we might have about our "new environment" and to give us a little information about the camp, its inhabitants and ways and cus oms we should respect before we go out and have a first look around the camp. That’s about it for now. If we have other questions, we shouldn’t hesitate to put them to her or to Martine. Everybody sets out now to the EJE centre (Education, Games and Children in French) where three of “our” young Palestinians are waiting to meet us - Baha, Mohamed, Hassan, as well as Tareq who is their former teacher. We greet them, all of us feeling a bit shy the, we meet Nidal, the director of the centre, who gives us an idea of the various activities organised here for the children of the camp. He informs us that the day after tomorrow, the Centre is taking part in a Puppet Festival in Hebron : we are welcome if we feel like joining them. We thank him for the invitation. We also meet Samaher, who works as a coordinator of the activities in the centre and Sarah, Tareq’s beautiful wife… She has been observing us discreetly for a moment and now looks completely reassured: we look OK to her. What’s more, she was wondering who this “Anne-Claire” could be, whom her husband was always talking about so warmly: no danger in sight. 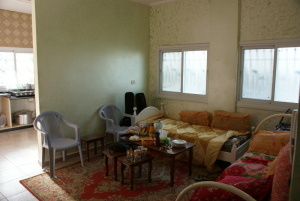 Four of us leave now to do some shopping and buy some foodstuffs in a little shop owned by one of Tareq’s friends. We need a bit of everything, except for sugar, tea and coffee (which are here almost as holy as wine can be for French people!) as there is already some in the kitchen. Then, we cook dinner: we prepare a madjadara (rice with lentils, fried onions and tomatoes) as well as mint tea. We spend our first evening in Al-Arroub with Baha, Mohamed and Hassan, whom we congratulate for his correct answers to our who’s who quiz. He smiles and says modestly that he asked his friends for some help. We are all still a bit shy and try to find our way to each other in a broken English. We tell each other about our age, our studies, the kind of music we like. Finally, we take out our guitars, show our new friends a few basic chords and sing in English together. A little later, Tareq knocks at the door. He has come with a friend, Bassam, who is absolutely mad about narguileh/chicha. Those whohave a try at smoking it will cough until they have tears in their eyes, to the great pleasure of the no-qmoking lobby. Some of us, indeed, don’t like being drown into such puff of smoke but can we really complain ? Chicha is the instrument of conviviality here! We’ll tell them to smoke outside tomorrow. So we conclude this first Palestinian evening soothed by the fragrance of apple tobacco and by laughters, before we all go to bed for a good night’s sleep. For more information, visit : www.sheikhjarrah.com and www.coalitionforjerusalem.org as well as OCHA. Voir quelques vidéos de 2009 sur la famille Al-Kurd et les expulsions à Sheikh Jarrah. 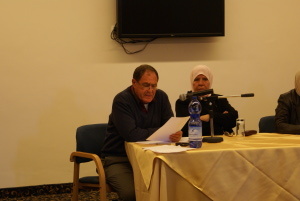 read article "La présence palestinienne à Jérusalem", by Elias Sanbar. 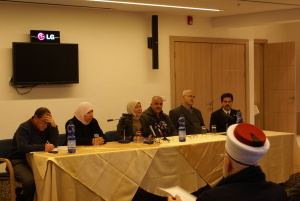 Read an extract of the press release as well as a more recent article (Octobre 2011) "Les écoles palestiniennes à Jérusalem-Est protestent contre le programme de cours imposé par les Israéliens". 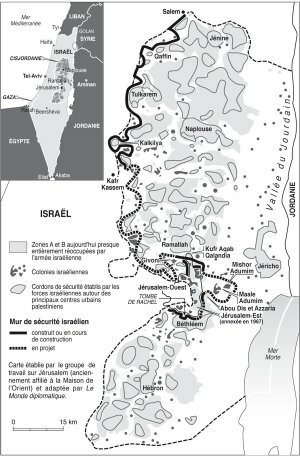 In addition, read about the controversy raised by the mentioning of Nakba in French schoolbooks : articles by Marie Kostrz (Rue89) and Dominique Vidal (Monde Diplomatique). These cars have a green license plate, which doesn’t allow them to drive in Jerusalem and Israel. Territory under the British mandate from 1922 to 1947 (before the UNO partition plan), reuniting what corresponds today to Israel, the Gaza Strip and the West Bank. EJE is a Palestinian association Les Enfants, le Jeu et l’Education whose aim is to « make the children grow to more humanity ». See the little dabkeh demonstration (traditional dance) in the Women Centre. which both organize sports and cultural events as well as training. See map above : Road 60 links Jerusalem to Hebron via Gush Etzion block, i.e. 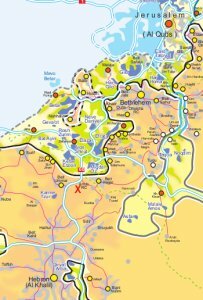 22 Jewish settlements currently inhabited by more than 60,000 settlers. The first Jewish attempt to colonise the area dates back to 1927 and was done by Yemenite religious Jews. These people were made to feel welcome by the inhabitants of the neighbouring Arab village, Beit Ummar, during the 1929 Palestinians revolts. In 1932, there was a second attempt to establish a kibboutz (Kfar Etzion), but the 1936-1939 Arab revolts thwarted the project. New attempt in 1943. At the beginning of the 1947-1949 Israeli-Arab war, there were 450 residents on 20km². Several dozens of them, who had stayed to defend the kibboutz, were killes by the Arab forces on May 13 in 1948. After the 1967 Six-Day war, the rebuilding of the Gush Etzion block started with the re-establishment of Kfar Etzion kibboutz, which is closest to Al-Arroub camp. Read the account of Friday, April 8.